Why Choose Dean Powell Constructions As Your Townsville Builder? Dean Powell Constructions is one of Townsville’s most trusted builders with a reputation for meeting promised timelines and keeping costs under control. The attention to detail and the loving care our committed team demonstrates has earned the respect of our clients who enjoy a stress-free home building experience. So what does this mean to you? If you want to stop worrying you’ll have to take on extra debt, suffer delays or battle with stress throughout the construction process…we promise to make your experience enjoyable and rewarding. Our mission is to provide a building experience which clients actually enjoy…without disrupting their daily routine. From the very first meeting our clients are reassured of our commitment to deliver a customer experience which will exceed their expectations. With this in mind we offer a 10 Point Rock Solid Guarantee, which is unrivalled by any other builder in Townsville. We guarantee to be accommodating with requests for minor changes at any stage of the project. We guarantee to treat you professionally and courteously 100% of the time as if you were a member of our own company. We guarantee to build your home with longevity, durability and maintenance levels in mind. We will do our absolute best to ensure you enjoy a lifetime of happy living in your home. We guarantee the materials we use will comply 100% with the contract. We guarantee to work to fixed time frames in which, barring unforeseen circumstances we will do everything in our power to uphold. We guarantee to respond promptly to your calls so you never have to waste time following up to get your concerns addressed. We guarantee an energetic and friendly working relationship. We love what we do and have great time meeting our clients’ needs. We Can’t Be Any Fairer As a Townsville Builder Than This Now Can We? There’s nothing we’re not telling you. We never spring surprises with undisclosed fees or “surprise” add-on charges. Of course we are always willing to provide you with advice and recommendations so you earn the respect of family members and the envy of friends when they step in to your dream home. ” We knew nothing about building and we mean NOTHING! So we decided to look at what we did know. We knew that Dean Powell Construction houses had great street appeal and seemed to have a unique look to them. We had watched Dean build his own home and then others in Annandale. We then asked around ‘as you do’ and found nothing but praise for Dean Powell and his company. Armed with this and some research into the residential estate we contacted Dean. ” We had the privilege of having Dean Powell Constructions build 3 houses for us. His attention to detail is second to none, with our second house wining 3 HIA awards: House of the Year, Best house in its class and Concept house of the year. ” We are extremely happy with the quality of our new homes and impressed by the level of follow up service from Dean himself. We have had passers-by, impressed by the outside of the houses commenting to us how beautiful they are and some even asking if they could have a look through them. All they can say is “WOW,” what beautiful homes you both have. Who was your builder? Are You Planning to Build a New Home in Townsville? Free 35 Minute Discovery Session that Reveals How to Avoid Costly Mistakes Which Could Turn Your Dream Home Building Project Into a Terrible Nightmare. Building your new Townsville home is probably the largest financial commitment you will make in your lifetime. However if you aren’t careful, you could easily fall into the trap of contracting a builder who’s only in business to make a profit. Meaning, their self-interest will always come before yours. The only way you can be sure of making the right choice is to become aware of the unethical practices some home builders use to make huge profits at your expense. Starting with a contract which is completely in their favour. How? By using vague open-ended clauses about various cost elements, performance commitments and quality standards. Failing to thoroughly inspect the construction site to analyse surroundings and identify circumstances which require special attention is another serious problem. Overlooking an important aspect of the construction process could lead to costly changes which the builder will expect you to pay. If you refuse, they’ll simply stop work. Builders rely on subcontractors to ensure quality standards are met and work is fully complete. That’s like a fox guarding a chicken coop. A subcontractor who makes a mistake, which will cost money to fix is likely to hide, rather than fix the problem. If your builder fails to inspect the work and find the mistake, then you will bear this cost in the future when the error is discovered. As you can see there’s a lot which could go wrong building your Townsville Home. The good news is this needn’t happen to you. As Townsville’s Multi-Award winning Building Company, we know the insider secrets and tactics which unethical builders use to turn a dream home building project into a nightmare. So we’re offering a Free Discovery Session to help you avoid the pitfalls of contracting an unreliable builder and how to partner with a builder you can trust. It’s valued at $297, but is free if you qualify. The most critical elements you must consider before building your Townsville home. 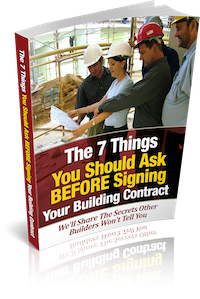 Questions you should ask every builder before signing a contract…weed out unscrupulous builders out to get your money. Construction traps to avoid and how to close all the loopholes builders use to squeeze more money at different stages of the construction process. The difference between building a house to live in and one for investment purposes…and right approach for each of these. How to take the hassle out of getting the $20k first home buyers grant…this is the no-fuss process to get approved fast. We will open the kimono and tell you everything other builders never reveal to their clients. There will be no sales pressure or time wasted. Sound exciting? Good, because it is! Here’s where it gets even better. If at the end of the discovery session you feel we haven’t provided the clarity you need to start building your Townsville home with complete confidence, we’ll reimburse you with a $100 Bunnings Voucher for having wasted your time. Yes! You Really Cannot Go Wrong by Saying Yes to This Offer. So, why is this for Free? For one, we’re all about ethics and don’t want you to fall prey to unscrupulous builders. The other reason is…and we’re being completely transparent here…. …if you decide to put your trust in us, we’ll be more than willing to help you get your dream project off the ground. But that decision will be entirely up to you. Click on the button below and you’ll be taken to a short application. As much as we would like to talk to everyone, our time is severely limited and we need to know if the discovery call will really help. If you qualify, we’ll schedule your 45 minute one-one-one discovery session at a time that meets your convenience. So, go ahead and request your Free Discovery Session. You’ll be glad you did. Download Our Free Guide On, What You Need To Know & Ask Your Builder Before Signing Your Building Contract To Avoid The Costly Mistake Which Could Turn Your Dream Home Building Project Into a Terrible Nightmare. In this FREE Ebook, we'll tell you what most builders wouldn't dare to tell you and what you can do to avoid some of the pit traps people fall into when building with a builder for the first time and how you can avoid it from the start.